Find all-new gear in the Wheels of Doom and Destiny! 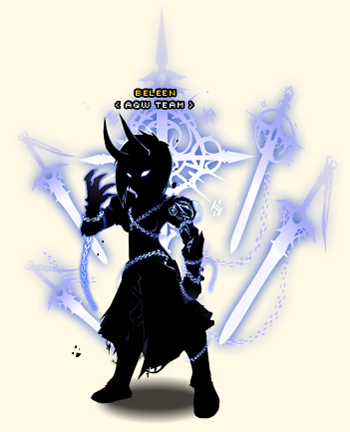 No matter whether you ally with Good or Evil, everyone loves awesome gear! 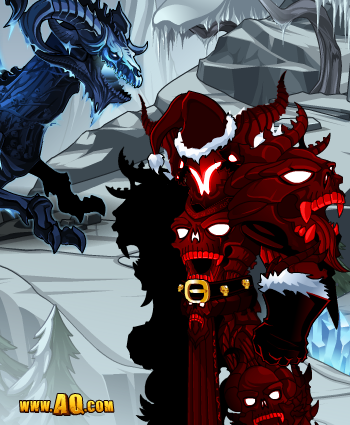 For a limited time, the Holiday Paragon Plate and Helm will be available from the Doom and Destiny merge shops when you /join fortuneAND will drop from both of the Wheels. Dage doesn't DECK the halls during Frostval... he WRECKS them! And THIS is the gear he uses to do it! The One Armor to Destroy Them All: SmogSlayer! The great beast has awakened... the dragon awaits! But one does not simply SLAY Smog... one must defeat him honorably in combat. Will YOU don the SmogSlayer gear and take down ALL the dragons? For K'Thurr! For Arashtii! For BLOOD! Innocent Trolls and Horcs have been Chaorrupted, and the tribes are starting to fall apart from the inside. 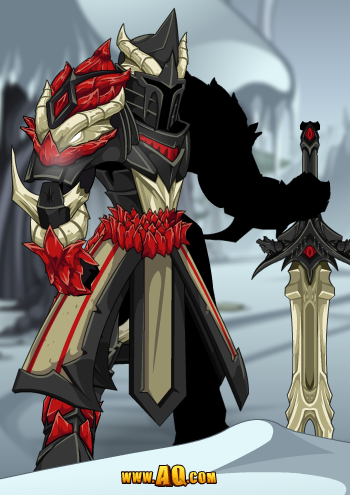 But when the Chaos Lord reveals their identity, Sokrakiis, Kagg, and all the residents of Bloodtusk see they need to join forces to protect their past... or their future will be consumed by Chaos! Join /ancienttemple to head straight to this week's release! 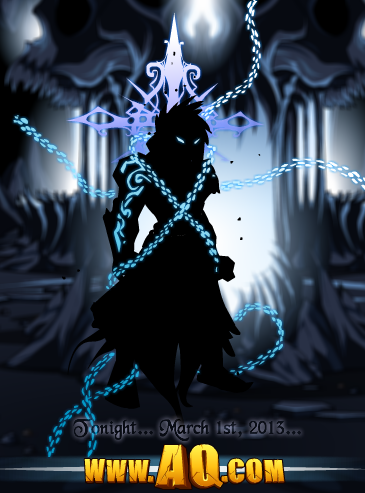 You'll need to be caught up in the storyline if you want to find out who the Chaos Lord is! Your favorite time-traveling salesman is back in BattleOn with a backpack FULL of Bloodtusk-themed gear! From the Horc DeathMonger and Trollish High Mage armors to the Horc Jom Dat and Mana Rune Aura, Quibble is bringing you the wickedest Ravine rares, so get them while you still can! The UnderWorld rises! 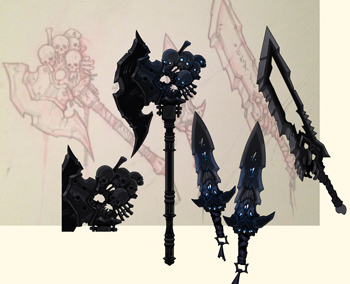 Dage the Evil's Undead Legion surges forth once more! 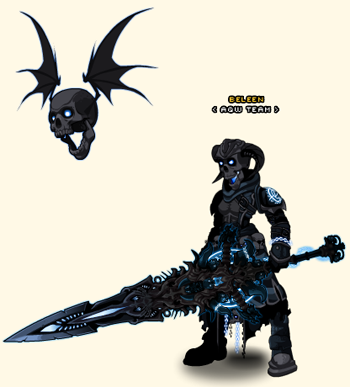 Prepare yourselves for TWO new epically evil armors in the Undead Legion merge shop! HeroMart - Swag for Heroes AND Villains! And more swag than you can swing a sword at! * We apologize, but Paladin Toilet Paper is still sold out. Pet o' the Month: Harvest Dragon! Burning leaves, chilly nights, Harvest feasts... and the Harvest Dragon pet! 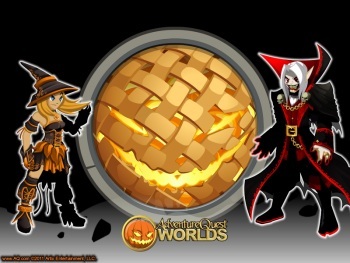 November is the month of the dragon and a time to be thankful, and WE are thankful that all of you keep playing and supporting AQWorlds! 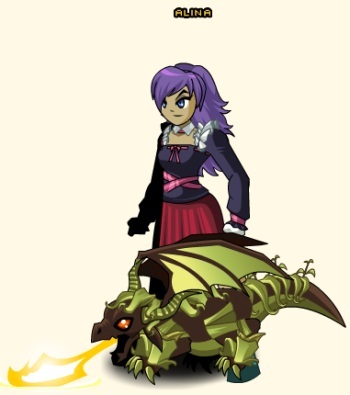 So head on over to Aria's Pet Shop to purchase the Harvest Dragon pet! The mists around Mystcroft grow thicker, and this Monday they will consume the town entirely! 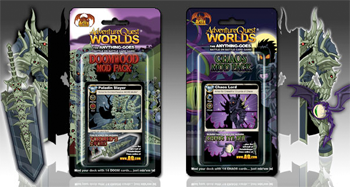 For a thrilling, chilling, delicous tale of evil and demonic desserts, head to MystCroft now to get your Mogloween 2011 rares! I Can Has Mod Contest! Have you heard that YOU can be a (temp) mod AND hang out with one for two hours? 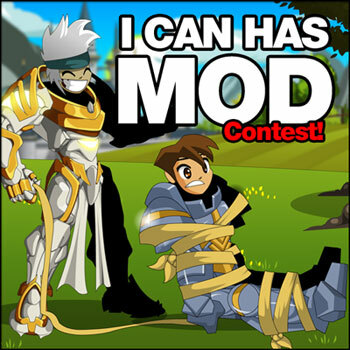 Artix is the first mod to volunteer for the "I Can Has Mod" contest, so if you want to talk to Lore's preeminent Paladin, get a sweet custom weapon, and BATTLE ON, check out this page for contest details! It's not who you think! The uneasy peace in Bloodtusk Ravine has been shattered... but it is beyond repair? Journey into ancient ruins, where Trolls and Horcs once lived peacefully, but which has been long abandoned. The Chaos Lord is here to twist that lingering spirit of harmony, chaorrupting the spirits of fallen Horc and Troll Guardians! But they aren't the only ones who have been defiled - tragedy will strike both Horc and Troll camps this week and YOU will need to help them see past the Chaorruption in themselves if they are going to have ANY future at all! You'll also need to battle your own sense of betrayal and injustice; the Chaos Lord's identity will have you questioning everything you know about the Trolls, Horcs, and loyalty! Quibble Coinbiter, beloved purveyor of gear from the past, present, and future, is returning to BattleOn this Friday! What will he have in stock for his Bloodtusk appearance? Who knows! But his backpack is sure to be full of gorgeous gear for mages and wicked warrior-type equips! Previews to come throughout the week, so be sure to keep an eye on the Design Notes and our Twitter accounts! 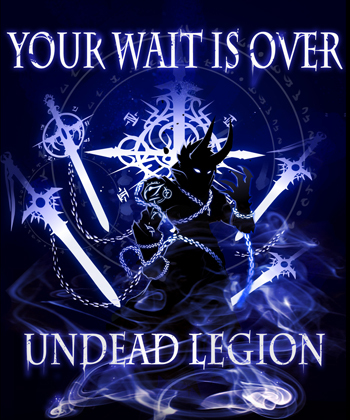 Dage's Undead Legion merge shop will be getting an update this Friday! We're excited to see your reactions to all of the new gear going there, but be prepared - you're going to have to battle your armor plating off to get it! 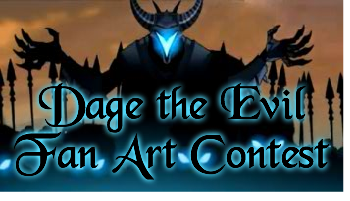 Check out Artix's Design Notes on the "I Can Has Mod" Contest for details on winning two hours of game time with your favorite mod! Artix is up first and he'll hang out, answer questions, and help you battle any enemy you want! There's some other sweet perks, like getting a wish granted, so why not check out the details! For every Golden Cheeseburger you own (purchased from Cleric Joy), AExtras offer you complete, or month of membership left on your account, you'll get another chance to win! Obrigado for supporting AQWorlds through Paymentez! When you use the Paymentez method of purchasing upgrades, ACs, or Artix Points on or after 11-11-11, you'll see a button in the lower right-hand corner of BattleOn. It will open up a shop containing the Centrovante Armor! This is just our way of saying thank you for your continued support!